Last week, 61.1 per cent of Dutch voters who turned out (the turnout was above the legal threshold to make the vote legal) voted against the referendum proposal to ratify a ‘preferential trade’ agreement between the European Union and Ukraine. It means that the Dutch government cannot, from a political perspective, ratify the EU initiative. It is the second time in its history that the Dutch have rejected a referendum about the EU – the last time was in 2005 when the EU Constitutional Treaty was soundly rejected. Then, the EU elites just ignored the democratic intent and bundled the initiative up into the Treaty of Lisbon and went about business as usual. Democracy is only useful to the EU elites if it ratifies their own self-interest. The same will happen this time. Merkel and Hollande have already said (in as many words) that they will disregard the Dutch outcome. The interpretations of last week’s voting outcome are now coming ‘fast and furious’ and the denialists are out in force – ‘oh, it doesn’t mean what it appears’ etc, and so the EU will just go about business as usual, as it always does, and that ‘culture’ is one of the reasons the whole European Project (now dominated by the common currency) is now proving to be an abject failure. It is a dysfunctional dystopia! Then citizens are watching the unfolding story from The Panama Papers, which only serve to confirm how top-level corruption, hypocrisy etc is rife and there is one (no) rule for them and another, harsher, binding rule for the rest of us. And, recent research findings suggest that our social settlements, where we live, bring up families, develop our aspirations and behaviours, are riven with rising inequality and increased segregation. Juxtapose that with the facts coming out about the urban backgrounds of young Belgians who achieve their aspirations by blowing themselves up and taking as many of us with them. The souls typically come from highly segregated urban enclaves in our cities with joblessness and poverty a daily burden. All of the above has been created by a neo-liberalism that works for the elites and aims to extract as much real income out of the system for the few as possible with as little democratic oversight as possible. 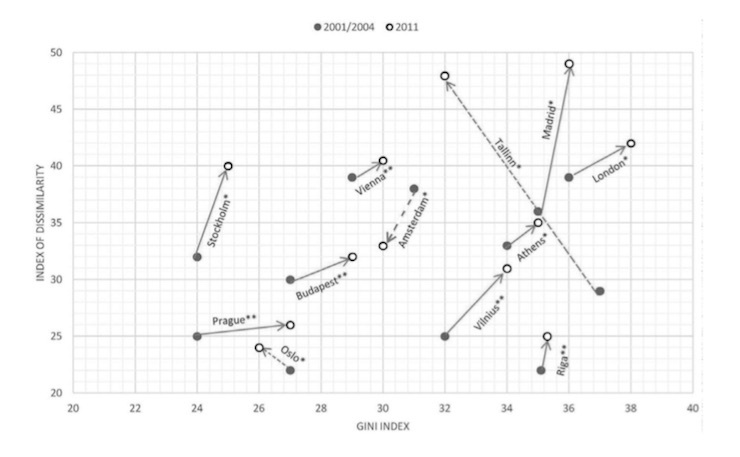 The topic today is motivated by a recent academic study – Socio-Economic Segregation in European Capital Cities. East meets West – published by a consortium of urban researchers in Europe. American urban researcher, Richard Florida has also written about this research (November 16, 2015) – Economic Segregation and Inequality in Europe’s Cities. You can also access two chapters from the book – Chapter 1 A multi-factor approach to understanding socio-economic segregation in European capital cities (the introduction) and Chapter 15 Inequality and rising levels of socio-economic segregation (the conclusion), which are informative and might motivate you to purchase the detailed book linked to above. The study is motivated by the observation that there are “Growing inequalities in Europe, even in the most to egalitarian countries” which are “threatening the sustainability of urban communities and the competitiveness of European cities”. The authors note that the extant literature on segregation in urban spaces has largely focused on “ethnic rather than socio-economic” dimensions. They acknowledge that the two dimensions are related but the growing incoming qualities warrant a particular spatial study of socio-economic segregation. The obvious underlying motivation is that rising “socio-economic segregation may lead to social unrest” and worse (Paris-Brussels). They are referring here “two recent riots in several European cities”. Socio-economic status is a powerful source of ‘spatial sorting’ via transport systems, housing, capacity to commute, schooling districts etc. In general, poorer people have less options – they are more reliant on public transport systems and can only afford to live in certain districts and get pushed out of traditional housing areas by gentrification processes (the better-off buying in closer to the city centres where the professional employment tends to be). Low-paid workers get trapped by the changing composition of industry, which, in turn, shapes the employment available, because they can rarely afford to move when their local labour market sheds jobs – even if other low-skill jobs are available elsewhere (which is often not the case). The obvious ethnic dimension in the urban context – the ethnic-religious enclaves – is driven by the low-ranked occupations and poor income. We need to always understand this link when trying to work out how to deal with social instability and its more extreme elements such as the ‘blow-themselves-up-bombers’. The authors argue that the rising socio-economic segregation in European cities is driven by a combination of “globalisation, neoliberalisation and welfare state retrenchment”. They study the spatial shifts in socio-economic segregation in 13 European cities: London, Amsterdam, Stockholm, Oslo, Vienna, Madrid, Milan, Athens, Budapest, Prague, Riga, Vilnius, and Tallinn. The choice is motivated by the fact that “these economic and political capital cities because they have been the most influenced by globalisation … [and that] … they do share similar positions in their countries as important locations for government services, as centres for education and jobs, and for international investments. The following graph (Figure 15.3 from the book) “shows the relationship between income inequality (Gini index) and the level of residential segregation between top and bottom social categories measured by the index of dissimilarity”. They point to anomalies (Tallinn and Oslo) where “income inequality was consistently growing in the 1990s” and the rising segregation now might just “point to the lagged effect of income disparities on residential segregation”. The authors note that the period following the end of World War II up to the mid-1970s was characterised by declining social inequality thanks in no small order to full employment, real wages growing in line with productivity and a coherent welfare state to support those who fell behind for one reason or another. The increasing dominance of neo-liberalism since the 1970s has “heralded … the advent of the era of mounting inequality, increasing class segregation and concentrated affluence and poverty”. I will leave it to you to explore all the details of the study and its findings if you are interested. 2. “Four central factors were found to play a major role in the changing urban landscape in Europe: welfare and housing regimes, globalisation and economic restructuring, rising economic inequality and historical development paths.” The impact of the GFC has been profound in advancing this rising inequality and segregation. Where I depart from the authors, and, in part, it is a reflection of a different emphasis (mine being primarily macroeconomic) is that the increased “(neo) liberal transformation of welfare states” has not been an inevitable outcome of increasingly global supply chains. That is the myth the Right has propagated (TINA) and the Left has swallowed with little scrutiny. The conflation of the globalisation of supply chains and capital flows and the neo-liberal free market rhetoric has been a powerful device in the hands of the elites, but the two are quite separate. The latter has relied on the power of the state. The longer term context to these trends is the way in which the dominant neo-liberal policy makers construct the concept and importance of the ‘urban space’. Prior to the rise of what we now call neo-liberal, by which we mean the prioritisation of the so-called ‘free market’ over state planning and regulation, which has led to increased ‘liberalisation’ (unless it damages the elites), retrenchment of the welfare state, suppression of real wages growth, massive redistributions of national income towards profits, rising inequality and elevated levels of unemployment. As we argue in our forthcoming book, the neo-liberal narrative of a diminishing state is a myth. The capacity of the currency-issuing, legislating state is well understood by the neo-liberals and, while they have publicly declared the state to be irrelevant in the globalised world, the reality is different, they have actively co-opted the state to advance their own ends at the expense of the rest of us. In the Karl Polanyi’s 1944 opus – The Great Transformation – we learn about the centrality of the state in the development of capitalism. The state has to maintain financial stability and allow for the privatisation of returns and the socialisation of losses (viz the GFC and the bank bailouts), it has to manage the unemployed and migration, and it has to manage land (zoning etc). In other words, there can be no ‘free market’ and ‘market capitalism’ is dependent on the state’s resources. Further, the interests of the elites are advanced by co-opting the state’s resources. Polanyi provided great insights which still resonate. He knew that if the elites get too much their own way via deregulation etc then a crisis follows and capital is first on the door of government for bailouts. The rise of the social democratic state which served to mediate the class conflict between capital and labour after the Great Depression was an inevitable result of the disastrous instability that a relatively unfettered capitalism produced. At the urban (planning) policy level, the dominance of neo-liberalism has severely undermined the pattern of development of the social settlement in our cities. Urban planning now means reducing government intervention and leading the ‘market’ determine the way in which cities will develop. We need always remind ourselves that the ‘market’ really means allowing those with more ‘dollar votes’ to have more influence, irrespective of whether the outcomes are beneficial to the broader population. This cuts across other trends such as the outsourcing of major public infrastructure under the so-called Public-Private Partnerships (PPPs), which essentially transfer public resources into the hands of a narrow group of private firms and beneficiaries. The problem is that the nature of essential public infrastructure is then largely determined by private, profit-seeking criteria. Further, the macroeconomic constraints that neo-liberal governments have placed upon themselves under the guise of ‘fiscal responsibility'(a.k.a. austerity), typically feeds down into unworkable constraints on local government activity, which often leads to endemic corruption at the local level where land developers have excessive influence on spatial development. This self-imposed fiscal constraints also lead to reduced levels of maintenance of public infrastructure, a decline in the volume and quality of public services provided at the local level, increased private provision of essential services (with lower quality and higher prices), and a plethora of profit-seeking corporate vultures seeking whatever public largesse they can get their hands on with little or no regard for the well-being of the local citizens. Planning processes used to consider the so-called ‘external’ impacts of particular land use activities. These concerns are barely considered these days and the processes set in place to evaluate them are often corrupted by corporate cash. The myth of ‘competitiveness’ at the local level is really about local governments being compromised to bid for corporate involvement irrespective of whether such investment is in the national interest type or location. I could go on and on about this. The nightmare is playing out in my own city at present as a result of the State government tearing up our train line leaving the city centre within adequate public transport and then proposing a series of changes which will benefit the land developers and privatise what is left of the public transport system. It is a total disaster but a classic demonstration of the impact of neo-liberalism on urban planning and land use. The importance of this work on rising socio-economic segregation is summarised neatly by Richard Florida (cited above). Dealing with growing inequality and economic segregation will require more than local action — it will require a renewed commitment to national urban policy. Nothing is the outcome of pure market forces. These allocations are always shaped by the policy structures that the state puts in place. Then think about some of those highly segregated and poor suburbs the north, west and south of the centre of Brussels where there is little employment and little hope. And along comes along a sales pitch that offers hope, identity and meaning …! A Kindle version will be available soon. Note 1: There is a typographical mistake in the book which although not repeated might throw your understanding. Bill, there’s a bit missing here and I think it’s an important bit. >>>low-ranked occupations and poor income. That might be one part of it, but you ignore the obvious religious and cultural unwillingness of a significant percentage of Europe’s Muslim populations to assimilate. You ignore it at your peril. The left must wake now on this issue. A really interesting post this and a change from the usual macroeconomic stuff – albeit linked. I’m not sure I agree with this. Florida says in his article “Socioeconomic segregation in Madrid is expanding and increasing in the suburbs, where wealthy residents reside, while the poor and disadvantaged remain increasingly concentrated in the city’s central districts.” Which is the opposite. He then goes on to say that in the case of London the rich are concentrating in the city centre. However, I would suggest that whilst the rich do indeed buy in Central London (super-rich that is), it is for investment purposes, the properties largely being owned by offshore companies. The rich and better-off are in fact moving out beyond the sububs in my experience. Quite who is occupying these properties in the City Centre I’m not sure – maybe politicians? My degree thesis was on art during the lead up to the French Revolution typified by the David’s “Death of Marat”. At that time, if I remember correctly as I no longer have the thesis, the rich were deserting Paris for the country, and grand country chateaux were being built. All this culminated in the Revolution as the poor became more and more disadvantaged. Are we seeing a repeat of this process? I live near Brussels and I know the city well. Driving from east (mostly affluent) to west is like entering another country. Near the Canal Zone and around the Chaussee de Gand and the Chaussee de Ninove it is like in a third-world slum. The old buildings are still there but are in bad shape, a real dystopia. Some neighbourhoods i would not get out of the car. Of course fanaticism is not only born in such conditions, but it’s not hard to imagine how it can thrive there. If i had no future prospects, no job prospects, no income, … I would become pretty desperate. Then it’s a small step to do stupid or dangerous acts. The long standing dysfunctional social situation in some European cities is a self inflicted injury. What were (and are) the powers that be thinking when they allowed millions of people from alien cultures to enter their countries and stay there? The answer is to follow the money, as usual. There is also the factor of more than a smidgin of dysfunctional thinking on the part of the so called “social elites”. Many of them are paid up members of the Bleeding Hearts Club. Naturally those club members would never think of living in the areas that their policy prescriptions have trashed. The Europeans will eventually have to reclaim their land from the invaders. That will be a very unpleasant business. By the way,the current crop of deranged monkeys who blow themselves up are motivated by religion, nothing else. Isn’t it strange how the predominant religion in the aforementioned trashed areas is – Islam. By the by the way, we are doing the same thing in Australia, just on a smaller scale. All the players are interchangeable with Europe. Stupidity has been globalized. Who could have known? I agree and disagree,of course poverty can serve as a cataliyst for people to explode themself,but there is a big but there is a lot of poor immigrants in closed communities and ethnic minorities and yet they are not explode themself because of that and why? Because pverty can serve as an catliyst for extremist tendencies but they should be there in their minds in the first place and no question radical islam is the foundation for this extreme behaviour. Daniel & Marty – Integration doesn’t happen overnight, it’s generational. What this generation needs to be is accepting, it’s hard to do that when they all going after too few jobs whilst the state undermines them at every turn and the media takes a morbid delight in reporting all the gory details while not giving a thought as to the motivation. You can hardly blame Islam for the spate of shootings in the USA which differ only in the method used to mass murder but have the same cause – suicidal young men. 1.This shooting incedents mostly done by white europeans mostly its have nothing to do with integration. 2.there is a lot of unitegrated populations in any immigrant recieving country but its usually way easier to integrate them into the society and they usually dont explode themself because of ideological fanatism. Dont understand me wrong i do think that integration efforts help and the situation which people are in this ghettos is a cataliyst for their radicalization but its cant explain everything about the situation.